Good wine starts at the vine. More than 40 different types of grapes are grown in Iowa that are specifically able to withstand our cold winters. Below are some of the more popular types of grapes grown here. Looks Like: Grey, small to medium-sized berry. Smells Like: Aromas of pineapple, apricot, peach, and citrus. Tastes Like: Peach, pineapple and tropical fruit flavors, with hints of honey. Used As: Produces a variety of styles from lively, refreshing table wine to sweet dessert and ice wines. Cold Hardiness: Very hardy to at least -35° F.
Looks Like: White, round, medium sized berry. Smells Like: Candied-fruit aroma reminiscent of fresh strawberries or Jolly Ranchers candy. Tastes Like: Fruity flavors like citrus, peach and green apple. Some also refer to it as “foxy”. 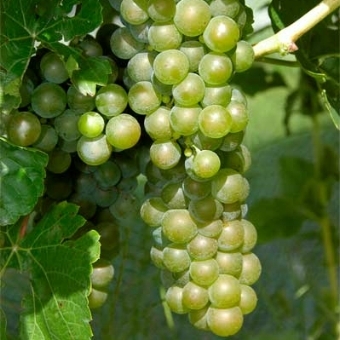 Used As: Produces sweet, aromatic, white wines. Cold Hardiness: Cold hardy to -30°F. Looks Like: Small, light green berries with a pinkish hue in compact clusters. Smells Like: Luscious floral, pineapple, apricot, fresh cut tropical fruit. Tastes Like: An assortment of citrus, floral and tropical flavors. Used As: Produces wines ranging from dry to the sweetest, late-harvest dessert wines. Cold Hardiness: Moderately hardy to -10 to -15°F. Looks Like: Though technically a “red” grape, Catawba has reddish pink berries producing pale pink juice typically used in roses or blends. Smells like: Very fragrant, like that of sweet strawberries. Sometimes described as “foxy”. Tastes like: Medium bodied, sweet yet floral and woodsy, tastes like strawberries. Used As: Versatile grape that can be used in producing sweet white, red, rosé and dessert wines as well as sparkling and ice style wines. Looks Like: Black color, small to medium sized berry. Smells Like: Think your wealthy grandfather’s off-limits “man room” with scents of rich leather and cigars. Tastes Like: Cherry and black currant flavors and aromas, notes of blackberries, pepper, plum, tobacco, leather, and spice. Used As: Produces medium-bodied semi-dry red wines. Looks Like: Black, round berries producing deep purple-colored wine. Smells Like: Earthy and dark berries. Tastes Like: Light to medium structure with earthy, herbaceous and jammy dark berry fruit with a slight smokiness flavor. Used As: Produces excellent red wines ranging from fruity and light to full-bodied and oaked. Cold Hardiness: Hardy to -25° F.
Looks Like: Small compact clusters producing garnet red wine. Smells Like: Slightly floral with jammy fruit and hints of earth and spice. Tastes Like: Red fruit with spice and earthy notes and a nice mouthfeel. Used As: Produces excellent red wine with low acid and soft tannins, in addition to making a great rosé. Pairs well with: Meats, such as grilled steak or wild game, or with hard cheeses.